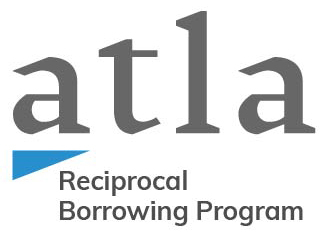 The Atla Reciprocal Borrowing Program creates an arrangement between participating North American Atla Institutional Members to grant check-out privileges to each other’s patrons/students. A patron/student walks into a participating library, shows proof of current enrollment at another participating library, and checks out materials based on the library’s local lending policies. Current Institutional Members in North America. A library may only participate if they can also receive students from other participating libraries at a physical library location. If you are a librarian at an eligible member institution, read the Reciprocal Borrowing Participation Guidelines and agree to adhere to them by completing the Agreement. Your library will be added to the official participation list. Atla provides opportunities for members to leverage the collective knowledge and resources of members to better serve our students, scholars, faculty, and institutions. Want to check out a book or other materials? Look to see if your institution’s library participates in the program and find a library close to you (and their contact information) on this map. A spreadsheet of participating libraries is also available. Promote the program in your library! Direct your patrons/students to this map of participating libraries to help them visualize where there are participating libraries. A spreadsheet of participating libraries is also available for your convenience. To update your profile and specify your library’s lending policies, fill out the Library Profile form. Customizable marketing collateral coming soon. Atla funds and administers a $5,000 annual lost item insurance fund for program participants. Libraries who have lent an item that has not been returned may make a request for replacement funds at any time. Requests will be processed twice a year (January and June). Both Lending and Home libraries will be required to document their best faith efforts to retrieve the item(s) from the borrower. If your library has lent an item and it has not been returned, download the Reciprocal Borrowing Replacement Item Fund Request Form. Contact Member Programs for more information. Searchable thesis and dissertation abstract database for programs of study related to ministry, theology, and religion.